We are an Australian stockist for DJ PUMPS (Dong Jin International Marine Tech. Co.). For the past thirty years, Dong Jin International Marine Tech. Company (DJ PUMP) has manufactured engine cooling pumps, electro-magnetic clutch pumps and strainers for seawater and fuel systems. Their engineering knowledge, development of new technology and many years of manufacturing experience has earned them an excellent reputation of quality and reliability. From development of pumps for new applications to vast improvement of existing pumps, all of their products are manufactured in their own facility to exacting tolerances and perfection. Manufactured in house, all DJ PUMP impellers can be fitted to most makes and models of flexible impeller marine engine cooling, bilge, electronic clutch and multi-purpose pumps. 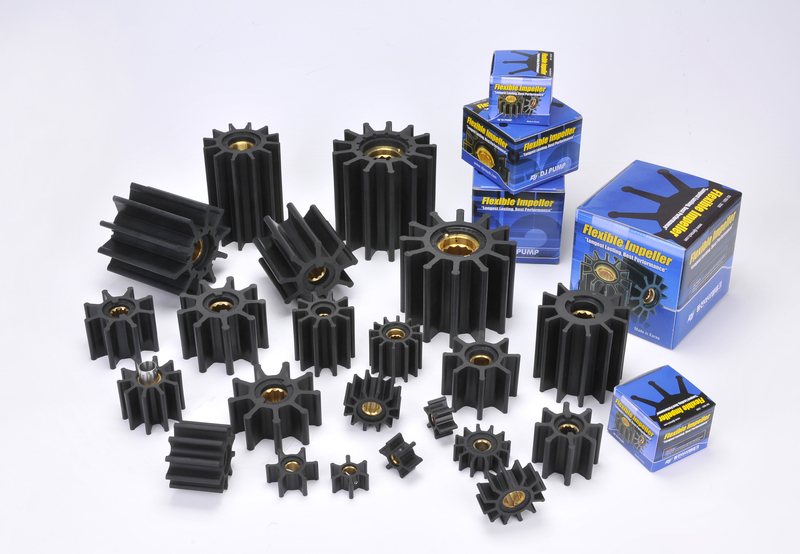 They are made of a special rubber improving the quality and extending the impellers life without sacrificing any flow characteristics. Our impellers provide increased durability and are more abrasion resistant than other leading brands. Sea water strainer traps debris and particles from entering pumps inlet to prevent clogging and potential engine damage. Fuel strainer/filter traps particles from entering into fuel system preventing potential engine damage and malfunction. Clear housing for visual inspection and strainer/filter is quick and easy to clean and replace. Oil Exchange Pumps make oil extraction quick, clean and easy. Please call or email our office and let us know your water pump requirements.